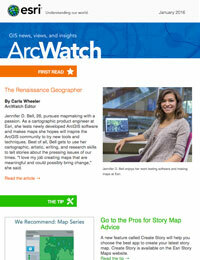 Created using the Esri Story Map Journal app, the Kids First Allen Story Map Journal was embedded onto the Kids First Allen organization’s website. It helped educate voters about why a school bond was needed, school construction plans, and the potential tax implications. 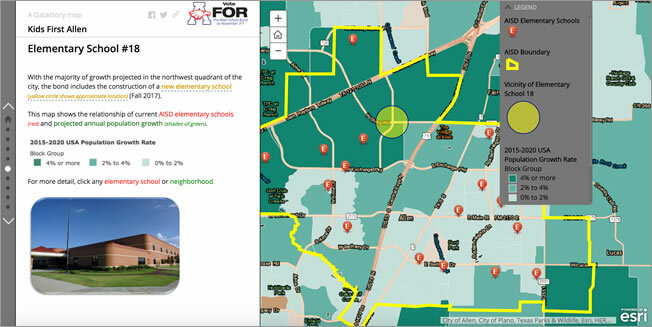 The Story Map Journal also was used for nearly 40 live presentations during various meetings throughout the district and was part of a direct marketing campaign to get out the vote. “Creating a Story Map allowed us to share lots of information to a tremendous amount of people and rally the community around their local schools,” said Hicks. AISD will use the bond money to expand facilities and improve programs in an area that’s seeing growth. Student enrollment, which has doubled since 1989, is currently 20,780 and is expected to grow 2.25 percent over the next five years. That is three times the national average. The bond will help AISD grow to meet that demand as well as help children prepare for college and twenty first century careers by building a STEM center that will serve up to 2,000 students each day.